Request support by submitting a new support ticket to Free Customer Support. After you submit a ticket, one of our support professionals will get back with you shortly with answers or assistance. Questions people often ask before choosing our tools for SEO and social media marketing. The questions our customers ask when using SEO PowerSuite. 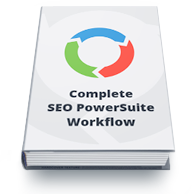 SEO PowerSuite Workflow is both a detailed SEO guide that takes you through all steps of an effective SEO campaign — and a most complete SEO PowerSuite user manual, as it tells you exactly how to implement these steps using the SEO PowerSuite tools.